Barnes and Noble’s Android powered e-book reader, the Nook. got itself a nice little update. Well it’s more than a little update, it’s a pretty substantial update, and long awaited at that. Firmware version 1.3, which rolled out on Friday, brings three new big features to the Nook. The Nook runs on a heavily modified version of Android, which gives it potential for a lot added features and overall usability. Barnes and Noble promised owners that they would see some added features down the road, and it looks like we are finally seeing those additions. This update makes the Nook a viable option in the e-book reader market. The major selling points of the new update include a basic web browser, Android games, free in-store reading of select books, and few important bug fixes and added performance to top it off. One new feature is the addition of a web browser. B&N has added a functional web browser, its currently a beta, but Nook users can now surf the web via wifi networks. The browser does not currently support Flash or JAVA, but it works well on most all popular sites. Users can access the web browser, through its dedicated button on the Nook home screen. With this update we also see the addition of Android games. Again they’re just basic games, but does make the Nook a more unique e-book reader. User can now play either Chess and Sudoku on the Nook. It is a very pleasing addition, and expect Barnes and Noble to add more games down the road. With that being said, don’t expect it to be able to compete with the iPad or iPod Touch, but still makes for a strong selling point. Some of the improvements that the update brings is better overall performance. One of the complaints about the Nook was the slow page turning speed. Before the update it was much slower than the Kindle, now it substantially faster and almost on par with the speed of the Kindle. Either way it’s a welcome improvement. There is also improved wifi functionality, and added color enhancements. The biggest and most talked about feature is the free in-store reading option. Users can now read any select book for free on the Nook, as long as you are inside one of Barnes and Noble’s retail stores. Users get one hour per book, and Barnes and Noble states that there is currently a selection of B&N Bestsellers, along with many classic books. Barnes and Noble hopes this feature will entice users to make more purchases, and their overall hope is that this bring more in-store sales. The Nook has a busy month news wise. Along with long anticipated updates, Barnes and Noble recently inked a deal with Best Buy. As of now potential customers can now purchase the Nook at Best Buy. 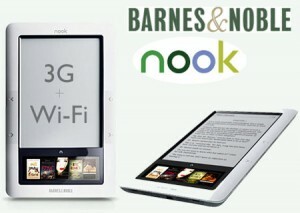 And just last week, B&N made the announcement of 2 new versions of the Nook, there is the Nook Lite and the Nook 2. The Nook Lite is a smaller wifi-only version, and the Nook 2 will be a updated version of the original Nook. Both will be released later this year, and will also be sold at Best Buy. Users can download the update now, in a few different ways. You can do nothing and wait for the automatic update that will push to your Nook next week. Or to install it on-demand, go to “My Library” and check for new content. After this, a tooltip will appear saying “You have a new software update”. Now you can check for updates with 3G or wifi, but you can only download and install updates while connected to a wifi network, no 3G. Lastly you can manually download the firmware update to your computer, from B&N’s Nook support page. Once you connect your Nook to your computer, you can simply drag the update onto the Nook and install.